Buhoma Lodge commands spectacular and uninterrupted views of the Bwindi Impenetrable Forest National Park home to the rare and elusive Mountain Gorillas. We offer a top quality, intimate lodge for our guests’ enjoyment in this area. 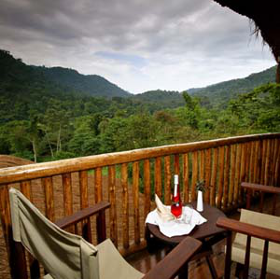 Situated within the National Park, Buhoma Lodge is a short distance from the meeting point for gorilla tracking and other activities in the area.